As commercial reactor economics have declined, utilities, with the acquiescence of the Nuclear Regulatory Commission (NRC), have burned nuclear fuel longer and crammed more of it into storage containers. This experiment has unresolved serious safety issues for storage, transportation and disposal of this highly radioactive waste; issues that have been essentially overlooked by nuclear regulators and the general public. 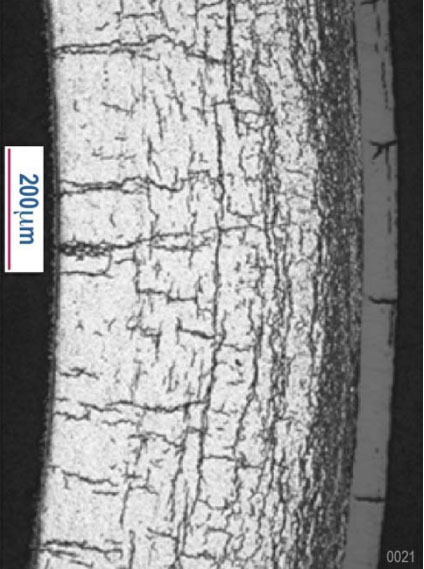 For high burnup fuel (HBF), the cladding surrounding nuclear fuel, is thinner, more brittle, with additional cracks. In a transportation accident, the cladding could shatter and a large inventory of radioactivity, particularly cesium, could be released. The NRC should stop use of HBF and make solving HBF storage problems one of its highest priorities. Almost all commercial reactors have HBF. Since the 1990’s almost all spent nuclear fuel (SNF) being loaded into dry casks is HBF. HBF is low-enriched uranium that has burned in the reactor for more than 45 GWd/MTU (GigaWatt days per Metric Ton of Uranium). Many Pressurized-Water Reactors have fuel with projected burnup greater than 60 GWd/MTU. The only issue NRC staff consider is the highest heat within a storage cask, but this ignores the fact that the cladding of HBF is thinner, more brittle, with additional cracks, as shown in Fig. 1. Longer cooling time will not solve these problems. Uranium fuel pellets, stacked within long thin tubes called cladding, are struck by neutrons and fission, producing heat. A collection of these tubes is called a nuclear fuel assembly, shown in Fig. 2. After 3 to 4 years, extremely radioactive and thermally hot fuel assemblies are removed from the reactor and stored underwater in a fuel pool. Following a cooling period of 7 to 20 years, 24 to 32 fuel assemblies are removed from the fuel pool and inserted into a fuel canister, which are then pushed into a concrete overpack shown in Fig. 3. Because of the poor economics of nuclear power, utilities are pushing the limits for how long fuel remains in reactors with dire consequences. HBF is dangerously unpredictable and unstable in storage – even short-term. HBF is over twice as radioactive and over twice as hot. The higher the burnup rate and the higher the uranium enrichment, the more radioactive, hotter and unstable fuel and cladding become. Fig. 4 shows the increase of heat output of fuel assemblies as a function of burnup. HBF requires a minimum of 7 to 20+ years of cooling in spent fuel pools before storage in dry casks. The years of cooling depends on the burnup rate, percent of uranium enrichment and other factors as defined in the dry cask system’s technical specifications. 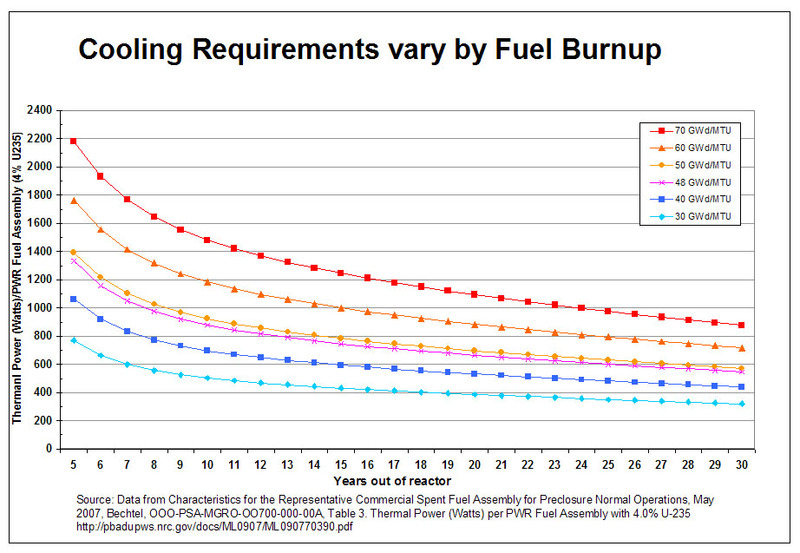 Lower burnup fuel requires a minimum of 5 years. See Fig. 5. HBF requires more storage space between fuel assemblies due to the higher heat, higher radioactivity, and instability, yet the NRC approves high density of fuel assemblies in fuel pools and dry casks systems. San Onofre requested use of a new dry cask system that crowds 32 fuel assemblies into the same space that currently holds 24. Absent a comprehensive safety analysis, the NRC should NOT approve the NUHOMS® 32PTH2 cask system for HBF, but is considering doing so this year. 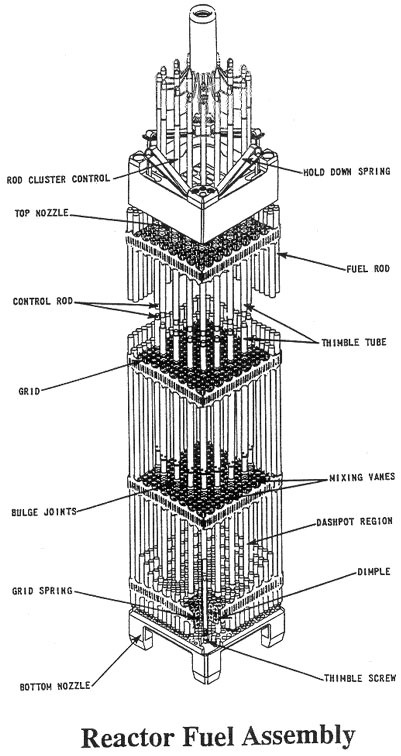 The NUHOMS system consists of a welded canister that holds 24 or 32 fuel assemblies; the canister slips inside a concrete storage overpack, shown in Fig.3. Diablo Canyon now uses a HOLTEC 32 fuel assembly cask system. No transportation casks for HBF have been approved by the NRC, so even if a waste repository were available, HBF could not be relocated. HBF nuclear fuel is approved for only 20 years storage in dry casks, based on faulty assumptions about how HBF reacts in the first 20 years of storage. There is insufficient data to approve HBF in dry casks for over 20 years, per Dr. Robert Einziger, Senior Materials Scientist, NRC Division of Spent Fuel Storage and Transportation. Experimental data show fuel with burnup as low as 30 GWd/MTU have signs of premature failure. As was done at Maine Yankee, all HBF assemblies should be containerized in damaged fuel cans for dry storage. HBF has major implications for pool storage before movement to dry storage. The NUHOMS 32 assembly cask requires up to 20 years and longer if HBF is to be transported. As seen in Fig. 4, HBF would require more than 30 years in storage before it could be transported. This has major ramifications for decommissioning reactors. Essentially, reactors cannot be immediately dismantled after ceasing operation. SAFSTOR is the only option. The reactor license must be retained for this period. A longer time is required before HBF can be removed from the reactor site. In addition, the current high spent fuel pool densities present an even greater risk due to inclusion of HBF assemblies. HBF has major implications for disposal in a repository. If DOE intends to open NUHOMS and HOLTEC canisters and repackage HBF for disposal, major problems may arise. Because the cladding is brittle and has cracks, it may be damaged during transportation and storage. Each HBF assembly may have to be containerized before storage, similar to damaged fuel assemblies. HBF has major implications for transportation. Transportation issues have not been well examined by NRC in NUREG-2125, the latest transportation risk assessment, a 509 page report with numerous references. But NUREG-2125 does not investigate transportation of HBF, a major oversight, as is discussed below. Public input on NUREG-2125 was unwisely curtailed at 60 days. The report was sold to the Commissioners by NRC Staff as a way to gather input from stakeholders, but in practice, this did not meaningfully happen. NRC staff required 7 years to produce this report, yet the State of Nevada’s request for an additional 30 days review was denied. NUREG-2125 should have been critically reviewed. NUREG-2125 is essentially a transportation risk analysis. As the critique by the State of Nevada shows, the NRC picked and chose which of its reports to include as references. Important accident sequences were not included. Here are just 3 examples of many, some of which are discussed in footnote 19. Transportation casks have impact limiters at each end. Therefore, the most vulnerable position is a side impact, where the impact limiters are avoided, the so-called backbreaker accident. The references not chosen by NRC discuss this accident. NUREG-2125 does discuss a side impact by a train at a RR crossing. If the train sill directly impacts a transportation cask, the forces and accelerations can be great enough to stretch the bolt lids and leave an opening to the cask interior. But cited references do not include the 1-ton impact limiters at each end, which would increase the bending. For HBF, 140 g forces, a 60 mph side impact, would easily shatter the brittle cladding. HBF has over twice the cesium inventory. There are serious unanswered questions about long duration, high temperature fires and effect on cask and fuel cladding. Casks have neutron shielding on the outside, generally boronated plastic, within a thin metal cylinder. Fuel would heat up with this plastic blanket, except for the fact that metal brackets that hold the thin outer metal cylinder in place are heat conductors. But in a fire accident, these metal conductors can serve as heat inputs to the cask. This is not correctly modeled by cask manufacturers. The State of Nevada has been asking for some time for full cask testing. These double layer casks, a canister within a transportation overpack, should be fully physically tested. Instead cask manufacturers rely on computer simulations and scale models. It is important to benchmark these computer models. Examples of failures by manufacturers to properly evaluate effectiveness can be found in the fire insulation failures throughout the US nuclear fleet due to inaccurate manufacture qualifications. Finally, malevolent events should be seriously examined. We do not have confidence this has been done. Anti-tank weapons such as the Russian Kornet, or French Milan, can easily penetrate 1 meter of metal. For transportation, the concern is about events that include entrance and exit holes. This is of particular concern with HBF, with large Cesium inventories and suspect fuel cladding. Stop approval of high burnup fuel (HBF) use. Stop approval of HBF dry cask storage. Make solving high burnup fuel storage problems one of its highest priorities. 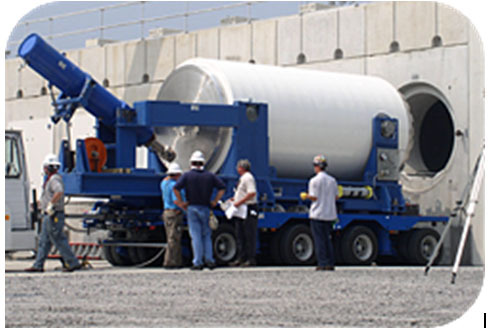 The DOE EPRI “Demonstration Project” (EPRI High Burn-up Dry Storage Cask Research and Development Project), that NEI is promoting is not a solution. This project only tests HBF in existing cask technology (TN-32). The TN-32 cask isn’t even approved for HBF. Over ten years after HBF was first produced and stored in dry storage casks, the industry has finally begun to study the consequences. The NRC has been asleep at the switch, allowing this dangerous experiment in the field to proceed. Develop adequate strategies to detect and mitigate unexpected degradation during dry storage. Absent a comprehensive safety analysis, not approve 32 assembly casks for HBF, such as the NUHOMS® 32PTH2 cask system. Require all HBF assemblies be containerized in damaged fuel cans for dry storage. Require full cask testing, rather than computer simulations and scale models. Reject NUREG-2125 Spent Fuel Transportation Risk Assessment as inadequate as it does not address HBF. As of 2012, most fuel in pools for future loading is high burnup and approximately 200 loaded-casks contain HBF. After 2008, many other sites have casks that contain HBF up to 53.8 GWd/MTU, according to the Nuclear Energy Institute. GAO-12-797 SPENT NUCLEAR FUEL Accumulating Quantities at Commercial Reactors Present Storage & Other Challenges, August 2012, http://www.gao.gov/assets/600/593745.pdf. Low-enriched uranium = up to 5% of U-235. 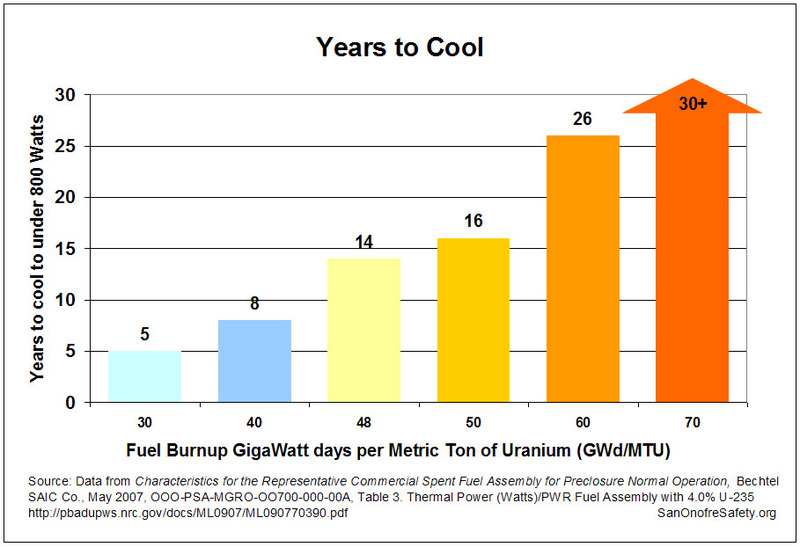 GWd/MTU is the amount of electricity produced (gigawatt-days) per metric ton of uranium. This entry was posted in Nuclear Waste and tagged Diablo Canyon, DOE, dry cask, energy, environment, fuel cladding, high burnup, hydrides, Marvin Resnikoff, NRC, nuclear, nuclear disaster, nuclear power, nuclear reactor, nuclear waste, san onofre, spent fuel pool, transportation, zirconium. Bookmark the permalink. If you’re getting the DRIFT from Japan, you can well imagine the importance of getting our nuclear program under strict supervision and monitoring. There are few items on the nation’s safety priorities list than properly securing our nuclear baggage. Carpe Diem ! THANK YOU, Marvin and Donna! This is so helpful. And so discouraging, of course, as all your great work is. I wish I could give you more stars! Trying to quickly look at dangers of Crystal River NPS and Hurricane Irma…NRC blowing off risk SNF fire because it is old but they used high burnup.